POWER PAK: 1 CASE CARBO-PRO Packets (12 units) + 1 VO2Max (150 Caps) [POWPAK] - $54.95 : CarboPro and Hydra C5 Ultimate Energy For Endurance Athletes, CARBO PRO manufactures the finest and the best nutrition supplements for Power Strength and Endurance Athletes. Based on the latest research and scientific findings. Go Stronger, Faster, Farther, with less effort! 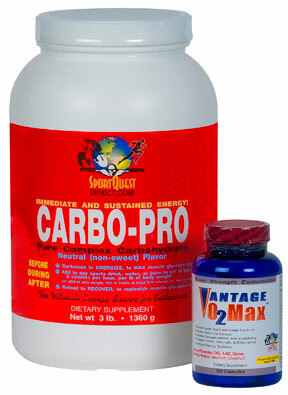 POWER PAK provides the benefits of both CARBO-PRO and VO2Max ENDURANCE at a great discount: ENERGY AND ENDURANCE. Pure Calories from CARBO-PRO; and Phosphate-electrolytes; Aminos; and metabolites from VO2 Max. For details please see CARBO-PRO GMO-Free and VO2 Max ENDURANCE. CARBO-PRO provides safe, clean, efficient calories for any exercise activity. GMO-Free Identity Preserved. GLUTEN FREE. Contains NO preservatives, color, dairy, soy, sweeteners or yeast. Premium fuel, non-sweet (plain flavor) pure complex carbs. Consume BEFORE, DURING, and AFTER, for energy, endurance, recovery; anytime, anywhere, for ANY sport. = 400 cals to 600 cals for 2 hours. Phosphate-Electroyltes, key Aminos, metabolites, and Adaptogens make it a Powerful Ergogenic Aid. For Power, Strength, and Endurance. Use it regularly to Optimize the ATP/CP, lactic acid and anaerobic energy systems; Extend endurance; Reduce accumulation of ammonia and other metabolic wastes; Increase oxygen availability by 12%; Increase maximal power output by 17%; Buffer lactic acid build-up; Elevate both aerobic and anaerobic threshold; To beat the Burn and prevent (DOMS) Delayed Onset of Muscle Soreness. Perfect for phosphate loading. How to use VO2 Max Endurance? As a dietary supplement - take FOUR to FIVE capsules 30 minutes to 45 minutes before exercise activity. During Activity, (long training rides/runs or races) take TWO to THREE capsules of VANTAGE per hour of activity. For PHOSPHATE LOADING, for FOUR to FIVE days leading up to the race, take FOUR capsules of VO2 Max after breakfast -OR- lunch, each day. 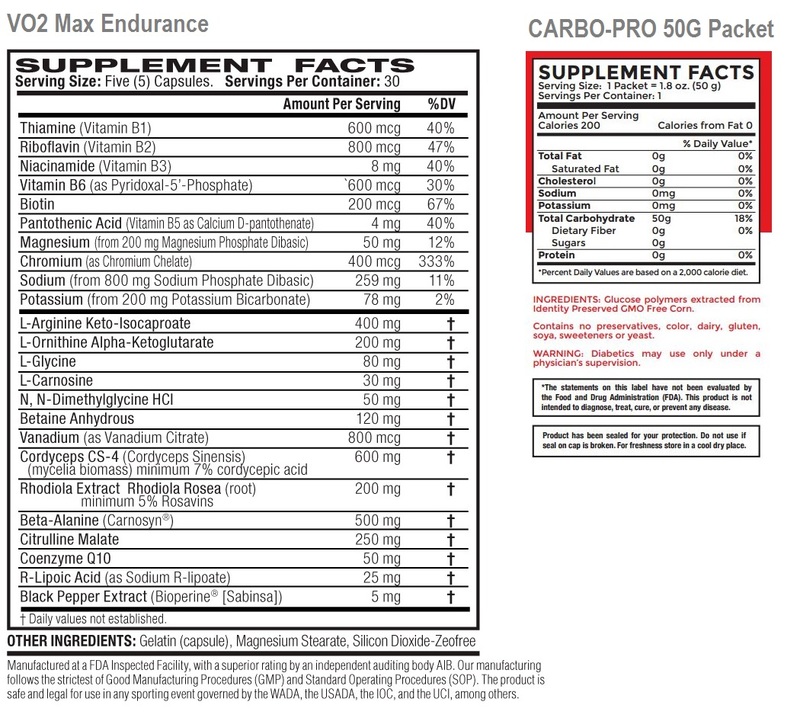 Please see detailed Product Information under CARBO-PRO GMO Free and VO2 Max ENDURANCE.